The Company respects the privacy of all its customers and business partners, and treats personal information provided by you as confidential. We pledge to fully comply with the requirements of the Personal Data Protection Act 2010 of Malaysia. We use your personal data and information in order to fulfill our commitment to providing you with distinctive standards of hospitality service. Fulfilling reservations or request for information of services. From time to time, we may disclose and transfer your personal data and information (whether within or outside of Malaysia) to Bloommaze Hotel Sdn Bhd group of hotels and resorts, travel-related companies (for example, airline companies, car rental companies and excursion tour companies), and business partners who provide administrative, telecommunications, payment or other services to any of the Bloommaze Hotel Sdn Bhd group of hotels and resorts to facilitate your requests or provide you with goods and services you require and for the purposes described under the section “How we use Personal Information”. The recipients of any such data are contractually prohibited from using personal data and information for any purpose other than for the purpose the Company specifies. We may share aggregated demographic information with business partners, affiliates or other entities. This aggregate information is not linked or traceable to any personally identifiable information about you. Except as described herein, we do not permit the sale or transfer of personally identifiable information to third parties. We may not use your personal information for direct marketing without your consent. We will always ask for your consent before we use your personal information for direct marketing. 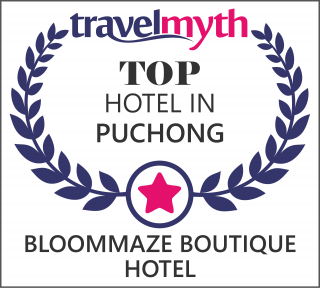 You may opt-out from receiving marketing communications at any time, free of charge, by following the "opt-out" instructions contained in the communications or contacting Bloommaze Hotel Sdn Bhd in accordance with the section "How to Access or Correct Personal Information". Visitors to our website www.bloommaze.com do so on an anonymous basis. We have not configured our website to collect any information from your computer without your input. This means that unless you voluntarily and knowingly provide us with information, we will not know your identity, your email address, or any information identifiable to you. To enhance your experience on our website, some of our web pages may use “cookies”. Cookies are text files that we place in your computer’s browser to store your preferences. Cookies, by themselves, do not tell us your email address or other personally-identifiable information unless you choose to provide this information to us by, for example, registering for one of our services. However, once you choose to furnish the site with your personally-identifiable information, this information may be linked to the data stored in the cookie. We will abide by any request from you not to send you direct marketing materials. When such a request is received, your contact details will be “suppressed” rather than deleted. This will ensure that your request is recorded and retained unless you provide a consent that overrides it. We reserved the right to charge a reasonable fee for the processing of any such access request. As indicated above, all requests for access to your personal information must be submitted in writing to our office address 55, Jalan Puteri 2/3, Bandar Puteri Puchong, 47100, Selangor, Malaysia. When communicating your request, please be sure to include your full name, address and telephone number so we can ascertain your identity, and specify clearly the type of enquiry and the original source of data collection.